Last summer when we were at Powell’s City of Books in Portland, Oregon I found myself going just a little crazy filling two baskets full of books that I had never heard of, by authors I had never heard of. Not everything I bought was new to me, but for some reason I did buy an awful lot that day that was a total risk. 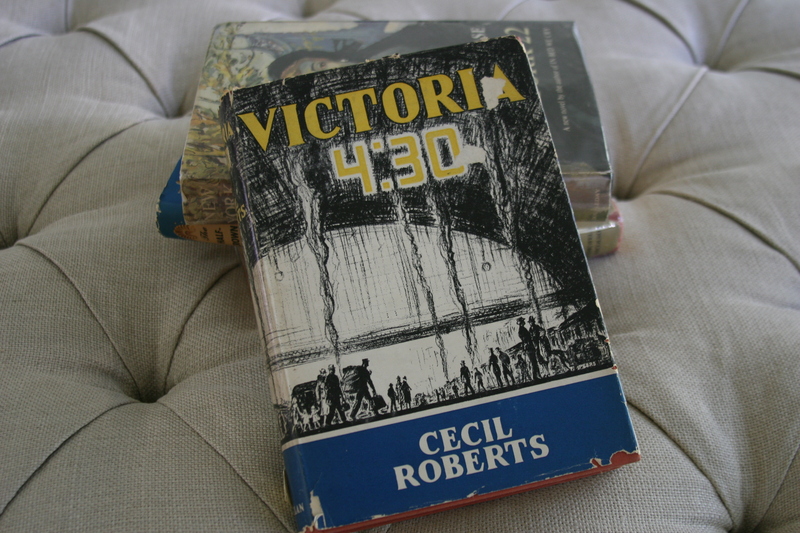 One of those books that I picked up was Victoria 4:30. Even before I saw the lovely cover drawing I suspected it might be referring to a train at Victoria Station in London. Given my predilection for train travel–especially of the vintage variety–I couldn’t help myself. Even though I popped the book in my basket, I was thinking that I might be spending $5.95 on an unworthy book. Not only were both author and title unknown to me, but there was nothing else by the author on the shelf (suggesting he wasn’t very successful), and I’m always a little bit wary of old hardcovers that still have dust jackets in fairly good condition. It suggests to me that the book didn’t circulate much over the decades. So I was fairly convinced that I had made a purchase solely because I liked the nostalgic drawing of a train station on the cover. I’m gong to hazard a guess that there are two moments of supreme bliss in a reader’s life that surpass all other pleasures of reading. Having the opportunity to curl up with the latest (or newest to you) novel of a favorite author. Taking a chance on a complete unknown and having it turn into something delightful. Once we are introduced to all 13 characters we see how they cross paths and interact (or not) on the journey, and we get resolution for at least some of the stories as various passengers get off along the way and meet their fate. Although the book feels very genteel in manner, it doesn’t shy away from getting real and story lines have dimension and depth. Not every story gets resolved and some resolved in ways I didn’t like, but that is just me wanting 13 happy endings. I just looked Roberts up on Wikipedia and note that he published about 40 books in his life. One called Grand Cruise, makes me think he might have repeated the Victoria 4:30 formula on a ship. To which I say: “Yes, please.” With so many books published, I think I have just discovered new quarry for my book browsing adventures. And on a side note, Roberts had a way of describing some of the male characters that makes me think he may have had some sugar in his water. This would make a perfect Persephone offering. I might need to drop them a line. This sounds absolutely wonderful. My library appears to have lots of Roberts’ travel writing and journals but none of his novels! Will certainly try to track this down through other channels. I have absolutely NO BUSINESS buying another book but this sounds like a must-read to me. Not a single copy on WorldCat, however, so I’ll have to buy one! I’m going to John King books in Detroit pretty soon so I’ll have to look for a copy while I’m there! What a wonderful find. And hooray, I can borrow it from Ali! I love this post. It is great to come across a new author. Especially one who has written so many books! I checked my library’s catalogue, and found twenty books by Cecil Roberts in reserve stock. Difficult choices lie ahead! That is a happy conundrum. I don’t think I will have that problem if I check with my local library system.